Quick overview Richard Wyndham's evocative and charmingly eccentric account of his tour of Sussex, Kent and Surrey, taken as Britain stood on the brink of the second world war. An eccentric, fun and informative read, following a self-confessed 'haphazard' journey along side roads. A remarkable and eccentric insight into the south east of England in the pre-war period. Richard Wyndham's 'last look round' was a tour taken immediately before the Second World War in 1939 and was originally published in the following year as South-Eastern Survey. Wyndham is a very agreeable companion as he travels in his self-confessed 'haphazard' way around the counties of Sussex, Kent and Surrey. Often eccentric but always good fun, he drives 'for the most part on side roads only, and through villages and lesser towns.' A selection of Wyndham's own black and white photographs taken on his expedition are included. 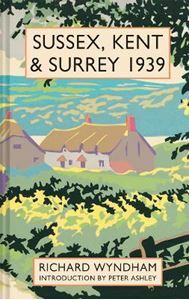 Sussex, Kent and Surrey 1939 is a wonderful insight into south east of England before the outbreak of the Second World War, which brought so much change to the country. Wyndham is a superb travel companion who completed the writing as he was called up for active service.